We all know about the myriad benefits of activity when it comes to reducing the risk of developing physical conditions such as cardiovascular disease, diabetes and some forms of cancer. That’s why parents are encouraged to teach their children to make exercise and other forms of physical activity a daily, enjoyable part of life. But what about the mental benefits? Depression is a significant mental health issue for adults and children alike. In fact, according to the National Institute of Mental Health, 12.5 percent of the U.S. population ages 12-17 experienced at least one major depressive episode. That’s an estimated 3 million U.S. adolescents / teens. 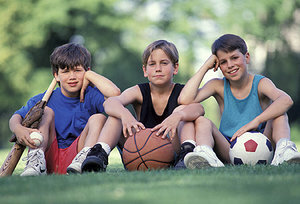 But there’s good news: Research suggests keeping kids active can reduce their risk of suffering depression. In fact, in one study, children who participated in more moderate to vigorous physical activity at ages 6 and 8 were less likely to have symptoms of major depressive disorder two years later. While there are some limitations to the study,the results make sense from a biochemical perspective: Exercise promotes the production of chemicals in the brain that improve mood, and also reduces the production of stress hormones. Low levels of mood enhancers (serotonin, etc. ), and high levels of stress hormones (cortisol, etc. ), increase the risk of depression. The moral to this story is simple: stay active! Model active behavior and participate in as much physical activity as you can with your children. It will benefit the entire family’s physical and mental health.